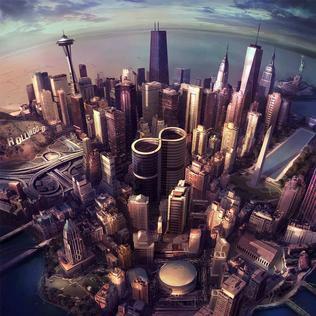 The cover art to "Sonic Highways" (seen above) is laden with information about the album's background. The distinctive '8' figure in the middle represents two things: firstly, that "Sonic Highways" is Foo Fighters' eighth studio album and secondly, that each of the eight individual tracks was recorded in a different city. The city-scape seen here is an amalgamation of the eight cities in which the band did recording work for the album. Frontman Dave Grohl explained this move as being aimed at allowing the band to draw inspiration and creative input from each of the different cities. According to him, the idea was for each track to contain features of each city's 'style' while simultaneously retaining the classic, guitar-heavy Foo Fighters sound that fans and critics alike have grown familiar with. The presence of guest artists on every single track appears to accord with this idea. 1. Something From Nothing (Chicago, Illinois): The album opens on a sour note. The first few lines set the tone for what turns out to be an extremely bland grunge number. I'm not sure what element of Chicago the band was trying to channel here - if anything, the band might as well have recorded this track in the UK, given that the main riff to this song is an unapologetic rip-off of the one in 'Holy Diver' by Dio. 2. The Feast And The Famine (Arlington, Virginia): This piece is more typical of the 'classic' Foo Fighters sound; it starts off with a lightly overdriven guitar hook, bursts into a rather louder verse section and is punctuated by Grohl's trademark raspy chorus-ending yells. However, it lacks the punch that made many of the band's earlier singles memorable. 3. Congregation (Nashville, Tennessee): This is the first track which immediately gives away what sound the band was trying for (if not the exact city in which the band recorded). The song opens nicely, with a country-rock feel, but falls flat around halfway through. All momentum is lost in the brief and totally random musical interlude in the middle, and Grohl's subsequent screams of "No false hope!" do more to provide irony than to save the song. 4. What Did I Do, God As My Witness (Austin, Texas): More country-rock here - it is clear from the first few tracks that this is the most comfortable 'new' territory for the band. Further, unlike 'Congregation', the softer ballad section in the middle complements the rollicking opening fairly nicely. The song is probably about 1 1/2 minutes longer than it needs to be, though - the ending bit adds nothing to the song at all. 5. Outside (Los Angeles, Calfornia): Replace the guitar hook in 'The Feast And The Famine' with a bass intro, change the key and take away Grohl's screams and you get 'Outside'. This is another track in which the opening makes the listener anticipate an all-time great Foo Fighters number and the chorus kills any such anticipation with certainty and finality. 6. In The Clear (New Orleans, Louisiana): New Orleans is considered as one of the cities responsible for the early development of jazz. The track notes list The Preservation Hall Jazz Band as guest artists on this piece. Unfortunately, this piece turns out merely average and has no hint of jazz in it. Worse still, the sounds of the Jazz Band's wind instruments are shunted to the back end of the mix. This track is not bad in and of itself, but disappoints considering the range of possibilities that having a jazz band around could have brought about. 7. Subterranean (Seattle, Washington): This drab, ho-hum number is comfortably the worst track on the album. Ben Gibbard's backing vocals add nothing to the track. 8. I Am A River (New York, New York): The album concludes with its longest track, a draggy piece with lyrics clearly inspired by the Taylor Swift manual of lyricism ("I ... I ... I am a river" - really now?). Grohl's voice is in fine form on this track, but it is wasted on thoughtless lyrics and an overall extremely flat and lifeless musical setting which is not helped one bit by the presence of a string ensemble. Overall, the album comes across as more like a collection of hastily-assembled ideas rather than a coherent whole; how so many of the songs start well and then careen into uninspired endings is evidence of this. There is an eclectic mix of guest artists, but their individual and collective impact on this album is negligible - one wonders whether the band roped them in just because it could or the guest artists bugged the band into giving them featured credits. This has to count as one of the band's blandest and most disappointing releases.